This extraordinary home was built by disgraced stockbroker and financier Dennis Bolze on a unique piece of property that borders the Great Smoky Mountains National Park. 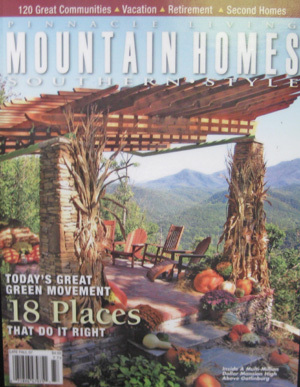 Completed in 2007, the home was featured in Mountain Homes Southern Style magazine as the ultimate mountain home with spectacular views. Bolze pleaded guilty in November 2009 to wire fraud and money laundering in connection with a Ponzi scheme worth over $20 million. Many of the investors who lost money were personal friends from Gatlinburg, although clients throughout the US and Europe were defrauded in the scheme. In 2008, Bolze disappeared from his Gatlinburg home when the Ponzi scheme collapsed. After several months, he was finally arrested in Pennsylvania and was convicted and sentenced to 27 years in federal prison. Many investors trusted Bolze with their life savings and believed that he was investing their money in a low-risk stock investment. Instead, Bolze spent the money on his lavish lifestyle as well as paying fake dividends to some investors to give the scheme credibility. In an effort to recover as much money as possible for the investors, Bolze's possessions were seized by the federal bankruptcy court and the Gatlinburg estate ordered to be auctioned to the highest bidder. As a result of the bankruptcy, Furrow Auction Company is honored to manage the auction of the Bolze Estate and invites you to take advantage of the opportunity to acquire this unique property at auction prices.